Secretary Wyman (in red) stands with Gov. Toshizo Ido and Gov. 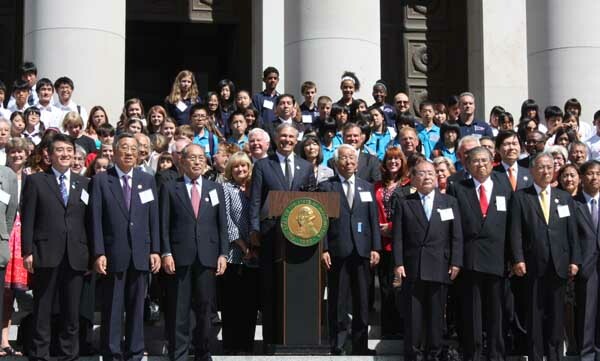 Jay Inslee at the Welcome Ceremony where the Japanese national anthem played, followed by the U.S. anthem. On a beautiful day in Olympia, Japanese and Washington leaders and Secretary of State Kim Wyman renewed a 50-year friendship with a joint agreement on Monday afternoon followed by a celebratory dinner. The Governor of Hyogo, Toshizo Ido, told the ceremony gathering on the Temple of Justice steps that he was pleased to be in Olympia and the weather is a refreshing relief from the current weather in Kobe. Roughly 250 Japanese from the Hyogo Prefecture gathered to meet the same amount of Washingtonians to renew, support, and respect the longstanding relationship between Washington and Japan. The event on the Capitol Campus included performances from both cultures, as well as private lunches for Washingtonian industries and their respected Japanese counterparts to build partnerships together. For example, the well known Kobe beef, from the capital of the Hyogo Prefecture, Kobe, was served at the event as well as one of the industries discussed at the private lunch. In return, from the Pacific Northwest, a weekend catch of salmon was offered by Washington tribes and became a showcase for the evening dinner. On Oct. 22, 1963, the Hyogo Prefecture became Washington’s first sister-state. Washington now has 12 sister cities in Japan. The sister-state relationship promotes cultural, educational, and business benefits for both sides. The friendship is the longest-standing relationship any U.S. state has with a Japanese prefecture and was signed by former Washington Gov. Al Rosellini during a visit to Japan in 1963. Both governors acknowledged during the signing ceremony the importance of continuing the relationship for another 50 years. In the photo below, Secretary Wyman accompanied with former Gov. Mike Lowry, Gov. John Spellman and former Secretary Ralph Munro before the official signing ceremony. Interesting read. I recently moved to Kobe in Hyogo coming from Washington knowing nothing about Washington and Hyogo as sister states.